Originally published in the WHO Goodwill Ambassador’s Newsletter for the Elimination of Leprosy, Issue No. 17 (December 2005). The information was correct and current at the time of publication. Treated and cured of leprosy, a Tanzanian boy has his life ahead of him. 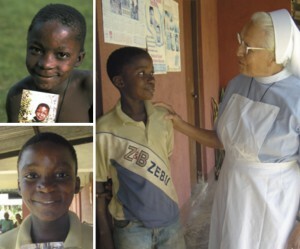 (Counterclockwise from top left) Isa in September 2001, holding a photo of himself before he began treatment; Isa in May 2005; and seen with Sister Maria Paula, also in May 2005. In September 2000, Isa Chonde was brought by his sister Aziza to Sister Maria Paula at the Nazareti Leprosy Care Center in Ifakara, a town about 400 kilometers southwest of Dar es Salaam, the business capital of Tanzania. He was nine years old and suffering from severe leprosy. Thanks to the treatment he received, Isa was cured and released one year later. Fortunately, he didn’t develop any permanent disabilities. Sadly, though, Isa’s mother wants nothing to do with him because of the disease. Today he lives with his sister Aziza, her five children and a niece of his other sister. Aziza’s husband died some years earlier. Together with three of her children, who have finished primary school, Aziza cultivates ten acres of sugar cane, which she sells to a nearby sugar factory. She also tends some five acres of rice fields, producing three crops every two years. What she doesn’t need to feed the family is sold on the local market. Now 14, Isa is an alert boy who enjoys going to school. His favorite subjects are English, Kiswahili, science and mathematics. What he likes most, however, is playing football. Isa’s teachers and all his schoolmates know that he once had leprosy; that he is now cured; and that he can’t pass the disease on to others. He is fully accepted by everyone. Isa’s teachers and all his schoolmates know that he once had leprosy. He is fully accepted by everyone.